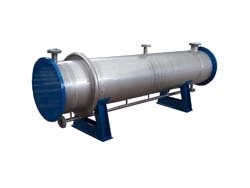 The tube condenser is commonly used machine that operates using heat exchange in the solvent extraction plant. Its advantages include a carbon steel and aluminum alloy steel composition, a low price and a compact structure. It is widely used in various fields. 1. High heat transferring efficiency. Low heat recovery; two kinds of heat transfer media can complete counter-current exchanges. Feel free to get in touch with us, we are always at your service!